Thus, at Christmas time, we tell that story. We tell it in so many different ways, but they are all stories of incarnation. There’s the pagan story of the rebirth of the great horned hunter God, viewed as the newborn solstice sun. Life and the rhythms of nature are incarnated in Cerenunnos. There’s the story of a red-suited elf with flying reindeer who brings us presents for no reason other than that it’s what he likes to do. Kindness and giving are incarnated in Santa Claus. There’s the story of one of those reindeer, who believes he does not have a place, and learns that the very same nose that is his shame, that is his brokenness, that is the thing about him that is wrong -- is also his strength and his great gift, and that he does have a place. Belonging is incarnated in Rudolph. There’s the story of Ebenezer Scrooge, who has visions one night that show him what life really means, and when he is imbued with this recognition of life, he responds with generous compassion and ebullient joy. For filmgoers, since the 1940s there has been the story of George Bailey in “It’s a Wonderful Life,” who sees a of vision in which he was never born, his dear friends and family do not know him, and he grasps the precious, dear sweetness of relationship – of the love made flesh. And also the story of a department store Santa who calls himself Kris Kringle who shows two department stores, Macy’s and Gimbel’s, that they’re better off cooperating. Let me linger on that last one for a bit, for this year is the 65th anniversary of the movie “Miracle on 34th Street” – and 2012 is the 60th anniversary of my congregation – the Unitarian Universalist Fellowship of Gainesville, founded in 1952 on the UF campus and now coincidentally on 34th street. In the story, as you may remember, one Kris Kringle is hired as the Santa for Macy’s flagship store on 34th Street. One of the roles of a department store Santa is to steer customers to buy things at that department store. But Kris Kringle will occasionally tell parents, “you might have better luck finding just what you need” at Gimbel’s, the rival department store. The Macy's management is at first horrified, but it turns out this sort of honesty and helpfulness impresses customers. Gimbel’s doesn’t want to seem greedy, so they implement a policy of referring customers back to Macy’s if Gimbel's doesn't have the item or if the Macy's version is better. This makes Macy’s escalate further, and spread the word throughout their chain to send customers to Gimbel’s if Macy’s doesn’t have exactly the right item. Kindness and honest helpfulness are good business. Kris Kringle broke Macy’s out of its scarcity mentality -- a mentality that said, "we’ve got to protect our turf, never help a rival, because there’s not enough to go around." It turns out retail sales is not a zero-sum game. When the stores cooperate to steer customers to the products they want, customers feel better about shopping, and are more willing to do more total shopping. Setting aside, for the moment, our qualms that "more total shopping" is not a good thing for our souls or our earth, the point remains that all sides gain from cooperation. Life is not a zero-sum game. 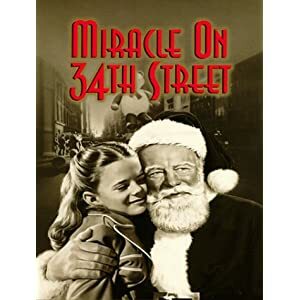 The miracle on 34th Street is that love is good business. That’s true on 34th Street, New York, New York, and on 34th Street, Gainesville, Florida. This is part 4 of 5 of "The Word Made Flesh"
Next: Part 5: "Business, Baseball, and the Spiritual Path"
Previous: Part 3: "Love Becomes Incarnate Many Ways"